Brand Flights identified a major opportunity for CertainTeed during the 2009 Stimulus Program, which injected billions of dollars into Weatherizing homes to save energy and create new jobs. We saw this as an opportunity for CertainTeed to use their 350 years of expertise to help ensure the success of the Weatherization Assistance Program. CertainTeed Corporation has partnered with the City of Philadelphia’s Department of Commerce and the Philadelphia Housing Development Corporation (PHDC) to provide business training to approved Weatherization Assistance Program (WAP) contractors. “As we increase the number of homes we weatherize and the number of weatherization job opportunities available, this type of partnership between city government and business is essential to supporting our small business community and opening up opportunities in the green economy to all Philadelphians,” said Mayor Michael A. Nutter of Philadelphia. The contractors received updates on trends and best practices on construction business skills in areas of finance, acquiring working capital loans, estimating, sales and marketing. The pro-bono training was offered to the thirty-nine PHDC approved contractors and enjoyed a healthy turnout with 11 attendees. Presenters included several members from CertainTeed including Jeff Rantz, senior manager of credit services, MiMi Skupski, senior territory manager, Insulation, Marla Hamilton, vice president of business development at the Philadelphia Industrial Development Corporation (PIDC), Jim Ash, vice president of marketing at George Kempf Supply and Greg Lee of Brand Flights. Approved contractors have undergone stringent training under state and federal guidelines to become qualified to provide weatherization services under the Stimulus Bill, totaling $252 million in Pennsylvania. Thirty-nine contractors have been awarded contracts to conduct weatherization work for the PHDC, which has received $16 million in weatherization funds for the next three years. The training has been in development since April 2009 and was modified to complement federal and state training that is specific to weatherization and building science. The Pilot Training program was held at the Lincoln Financial Field suites in January 2010. 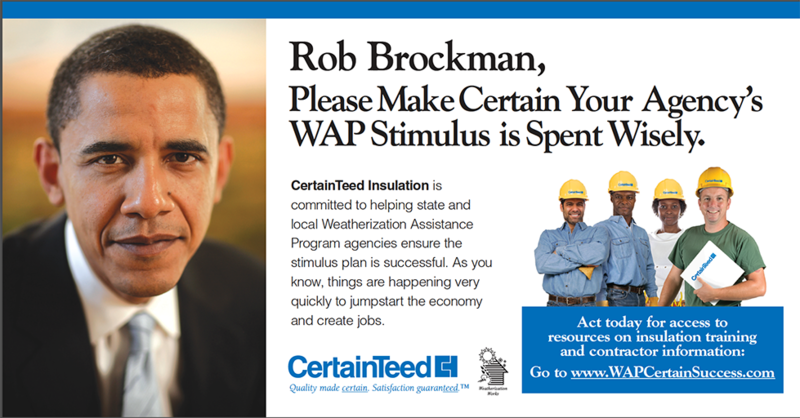 CertainTeed is committed to helping state and local WAP agencies and contractors ensure the stimulus plan is successful. For more in-depth resources on weatherization product and installation information, visit www.WAPCertainSuccess.com. Through the responsible development of innovative and sustainable building products, CertainTeed has helped shape the building products industry for more than 100 years. Founded in 1904 as General Roofing Manufacturing Company, the firm’s slogan “Quality Made Certain, Satisfaction Guaranteed,” quickly inspired the name CertainTeed. Today, CertainTeed(R) is North America’s leading brand of exterior and interior building products, including roofing, siding, windows, fence, decking, railing, trim, foundations, pipe, insulation, gypsum, ceilings and access covers.